This weekend, an experiment in mozzarella making at our house produced a product which looked like mozzarella and tasted rather like the dry and rubbery balls one buys here in the supermarket. In the hierarchy of mozzarella, our homely balls would be at the bottom. 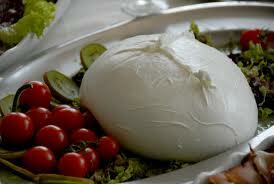 At the top, floating in their milky water would be the gleaming globes of mozzarella di bufala, buffalo mozzarella. The difference is say from Chef Boy-ar-Dee canned pasta to the real thing, homemade. 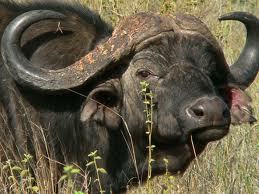 So what about these buffalo? 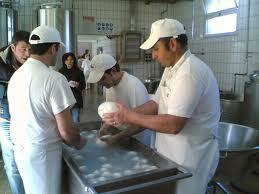 Mozzarella di bufala uses the milk of the water buffalo (see cute face, left), mixed with cow milk. I ventured into the contentious realms of history for my readers’ sakes to discover these truths from various sources, English and Italian. 1. The water buffalo was brought to Italy by the Goths (or the Visigoths) in the 7th Century C.E. Or the Lombards. Take your pick. 2. No, the water buffalo was used by Romans, even Greeks in pre-Christian Italy. 3. No, says the Consorzio per la Tutela del Formaggio Mozzarella di Bufala Camapana, the beasts came via the Normans in Sicily, who received them from the Arabs. 4. Or, says the Consorzio, the water buffalo, according to fossil evidence, are native to Italy after all. 5. No, Arabs brought them from India through Mesopotamia. Then pilgrims and returning crusaders brought them to Italy. 6. Or . . . all the above. Wherever they came from, the mighty beasts were useful in plowing wetlands (the nice big hooves don’t sink in) and are happily resistant to malaria. Vague references to cheese made from their milk appeared first in the 12th Century, then, definitively by one Scappi, chef to popes in 1570. The name comes from “mozzare” or “to cut off” since the latent cheese is kneaded by hand into a shiny paste, then a length cut off to make a ball or braid. Ideally made from the morning’s milking, eaten within hours, it is “oozing with freshness and richly flavored,” says one source. But eat mozzarella di bufala or some fine cheese you must, for as one of my sources intoned, quoting the French gourmand and foodie Brillat-Savarin (1755-1826), “a meal without cheese is like a pretty woman without an eye.” And who wants that? Note: our friend Francesco’s mother made wonderful salads with arugula, mozzarella di bufala, oil, vinegar and salt, marinated a few hours.